-Support FM full frequency point 87.5MHZ-108MHZ. -Automatic power off memory channel. -Support LCD color screen display. -Support U disk, TF card music playback. 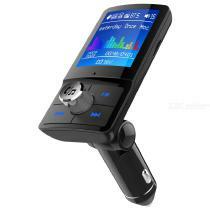 -Support Bluetooth answering, reject, hang up, redial and other functions. -Support Siri / voice assistant function. -Support for selecting folder playback.